We will offer the following real property at auction at the land located from the east edge of Trent, SD – 1 mile east on Co. Hwy. (240th St.) and 3 miles south on 479th Ave. to the NE Corner of the land at the Jct. of 479th Ave. and 243rd St.; from Dell Rapids, SD (Dell Rapids Public High School) – approx. 1 mile north 475th Ave., 4 miles east on 244th St. and ¾ mile north on 479th Ave. to the SE corner of the land. Auctioneers Note: This auction presents an opportunity to purchase a smaller parcel Moody County, SD land which has been in the Nelson/Smith/Ellefson Family for several decades and presents a great opportunity to purchase a relatively small parcel of land which potentially could be a nice location for establishment of a rural home site(s), an addition to an area crop/livestock operation or an affordable parcel for a beginning farmer or investor. 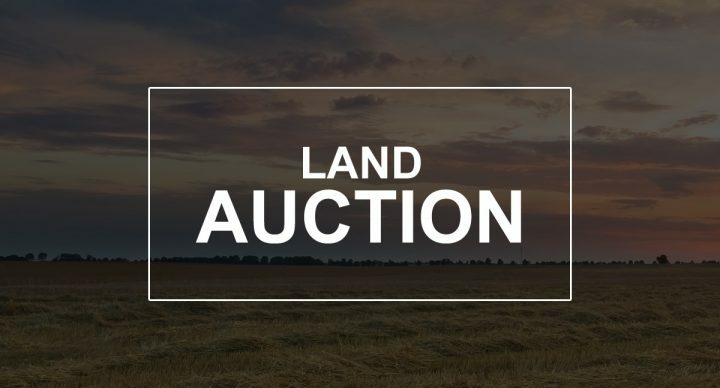 If you are in the market for a smaller parcel of land with potential for establishment of an acreage site, and land with a mixture of cropland and scenic pasture with a large stock dam, then be sure to inspect this property and plan to be in attendance at this auction. This +/- 79.36 acre unimproved farm will be offered as a unit. This property has potential to serve a myriad of buyers as this property features some very scenic hilly upland pasture that affords some excellent views overlooking the Big Sioux River Basin and surrounding countryside, with this parcel of land being inclusive of pasture with a large stock dam, along with 30+ acres of cropland. **NOTE** – The Cropland is Available to Farm in 2019; although the Pasture is “Under Lease” for 2019 based on 48 acres @ $75.00 per acre – a total of $3,600.00. According to FSA information this farm has approximately 30.46 acres of cropland, with the remainder in upland pasture with a large dugout providing an abundant water supply for livestock; with an FSA 13.5 acre corn base with a 134 bu. PLC yield and a 36 bu. soybean base with a 36 bu PLC yield and had been enrolled under the County ARC election under the previous USDA farm program. According to Moody County Assessment data this property has a soil rating of .661, comparatively information obtained from Surety Agri-Data, Inc. indicates this land has a soil productivity index of a 63.4. The general topography of the cropland is nearly level and the pasture is gently rolling to hilly. This is a well located parcel of land bordered by gravel roads on the east (479th Ave.) and on the north (243rd St.). The pasture area provides some areas with terrific views that could provide some attractive locations for establishment of a rural home site. According to Moody County Planning & Zoning this property has 2 housing allocations which are locked to each 40 (the NE¼ NE¼ and the NW¼ NW¼), with movement from one 40 to another subject to application for a variance requiring county approval, which is not guaranteed. According to Big Sioux Community Rural Water the nearest line is located in the S½ NE¼, for information concerning availability and cost, contact Big Sioux RW @ 605-997-2098. The 2018 RE taxes payable in 2019 on this property are $1,652.80. This is a small parcel of land which has potential to fit the needs of a variety of buyers with this land situated in southern Moody County, SD and near Dell Rapids, Trent, Flandreau & other area communities and within approx. 25 miles of Sioux Falls, SD. This property must be seen to be appreciated. For add’l. info. contact the auctioneers. LEGAL DESC. : The N½ NE¼, exc. the W. 2 Rods thereof, Sec. 31, T. 105N., R. 48W., (Blinsmon Twp. ), Moody Co., SD. TERMS: Cash – A 10% non-refundable earnest money payment on the day of the sale and the balance on or before June 7, 2019 with immediate full possession of the cropland acres for the 2019 crop year; the +/-48 acres of pasture are subject to a lease for 2019, and at closing the buyer will receive a payment for the pasture rent in the amount of $3,600.00 ($75.00/Ac.). All of the 2018 RE taxes payable in 2019 will be paid by the owners, with the buyer responsible for all of the 2019 RE taxes payable in 2020. Marketable Title will be conveyed and title insurance will be provided with the cost of the owner’s policy divided 50-50 between the buyer and seller. The acres in this farm are to be adjusted in accordance with a survey of the property as completed by Midwest Land Surveying, Inc., with the acres understood to be “more or less”. FSA cropland, yields, bases, payments and other information is estimated and not guaranteed and are subject to County Committee Approval and provisions of the New Farm Bill commencing in 2019. The existing fences may or may not be on the true and correct boundary and any new fencing will be the responsibility of the buyer pursuant to SD Law. Information contained herein is deemed to be correct but is not guaranteed. This property is sold in “AS IS” Condition and subject to existing easements, restrictions, reservations or highways of record, if any, as well as any or all Moody County Zoning Ordinances. The RE licensees in this transaction stipulate that they are acting as agents for the seller. Sold subject to confirmation of the Trustee of the Trust.